INTERNATIONAL CES, LAS VEGAS – Jan. 5, 2017 — D-Link today introduced the new Omna™ 180 Cam HD (DSH-C310), the Apple HomeKit enabled camera. The first in D-Link’s Omna family of HomeKit enabled devices, the Omna 180 Cam HD provides an easy way for users to monitor their home for extra peace of mind. With an elegant, modern design, the Omna 180 Cam HD offers a comprehensive 180-degree field of view to monitor an entire room and Full HD 1080p video quality for crystal clear surveillance. The HomeKit enabled camera includes advanced security features with end-to-end encryption and authentication between the camera and an iPhone, iPad, or iPod touch. Apple HomeKit technology also allows users to set up the 180 Cam HD within seconds, in just a few simple steps via the Apple Home app in iOS 10.1. Users can also get rich notifications on the lock screen of their iPhone or iPad via the Home app, showing a snapshot of what’s happening in their home when motion is detected. In addition, via HomeKit, the Omna 180 Cam HD can work seamlessly with other Homekit enabled devices including triggering scenes when motion is detected. ● 180-Degree Field of View – Omna is derived from the Latin word ‘omnis’ meaning all-encompassing. 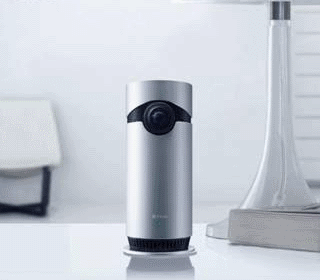 Most cameras offer a limited 130-degree lens, while D-Link’s unique 180-degree solutions and de-warping technology allow users to see just about everywhere and everything. ● Dynamic Video Streaming – The video bitrate continuously adjusts to ensure optimal performance given the available bandwidth. ● Two-Way Audio – Listen and speak using the camera’s built-in microphone and speaker, so even when users are not at home they can still make their presence known. ● Night Vision – See up to 16 feet in complete darkness with infrared night vision. ● Local Recording – Record motion detection triggered video clips directly to a microSDXC card up to 128 GB. Offers more flexibility on recording video locally to the camera without impacting network or Internet bandwidth, all with no recurring monthly fees. ● Omna App – Advanced features are available on the free Omna companion app. ● Stylish Design – The camera is designed to fit effortlessly into the modern home with an elegant, discreet and stylish design. ● Motion Detection – Triggers alerts and automatic video clip recording. The Omna 180 Cam HD (DSH-C310) will be available in Q1 2017. More information is available online at us.dlink.com. I appreciate Apple’s commitment to security in the IoT (which I’ve read is driving up costs and development time), and am also the kind of dinosaur who prefers turning my lights off via touchscreen rather than a voice interface (ala alexa, siri). But I do hope that Apple is planing on hitting the accelerator on HomeKit and Siri in iOS 11. There are a few use cases I have that seem obvious to me that aren’t possible yet. The main one, which I have suggested to Apple via feedback, is triggering changes in light state when video starts on the AppleTV. It would be great to have the lights in the room automatically dim to off when a video starts playing, and then automatically come back on (to a dim state) when the video is paused or finishes playing. And only Apple can give me that functionality. That is a neat use case. That is a neat use case. Hopefully they will listen to your feedback.